A slow growing, upright tree that broadens with age. Very narrow, strap-like red leaves in spring change to a reddish-green in summer. The effect of the leaves is lace-like. The fall color is yellow to red. 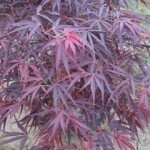 Like other Japanese maples, it benefits from partial shade, well-drained soils, and protection from drying winds. The original plant was found in an old garden in northern Italy, and introduced to the trade by van Gelderen of The Netherlands.